My girlfriend enjoys to make photo books from our travels, but she uses an old iPhone to take the pictures. For christmas I wanted to give her a better camera. However, I did not know a thing about DSLR cameras. Tableau came to my rescue. 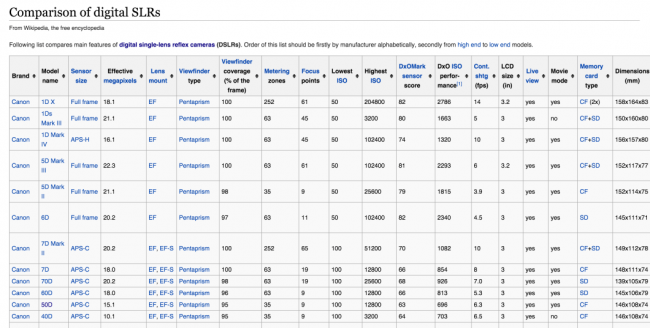 I Googled comparison of DSLR cameras and found a wikipedia-site with this very useful table. (Only part of the table shown below). However, it was difficult to overview the big amount of data in the table.I marked the full table and copied it. Usually a table like this can be directly pasted into tableau. However, I had to paste it into excel first and then load the excel sheet. I had to do this in order to get the correct field names. Aside from the weight measure, which I had to split to clean it from text, all my variables was ready to work with right away. Giving the list of dimensions and measures shown below. Now, I had to think about which properties that mattered most. I knew that she would get annoyed of a small LCD-screen. Therefore, I plotted the cameras on announcement year and LCD-size to see the development in screen size over time. From this it was obvious that if the model was from 2009 or newer the LCD-size would be fairly big (at least 2.7 inches) and 3 inches if the model was from 2012 or newer. Therefore, I put a filter on release year removing the oldest cameras. I asked some friends who knew a thing or two about cameras, which brand to go for. The general suggestion was to buy either Canon or Nikon. Therefore I put a filter on brand, selecting only Canon and Nikon. From the subset which I was left with, I then looked at the amount of effective megapixels. Same picture was shown again. 2012 or newer ensured a lot of effective megapixels, why I filtered on 2012 or later. A nice feature would also be to have HD-video recording. All the cameras I was left with had video mode, so that did not make a difference. My dad has the first EOS back from 1987. It is broken after many years of use, however his old lenses are still intact. They have EF mount, whereas newer lenses have EF-S mount. I wanted a camera which was able to use both. Since the Canon 100D are compatible with both, the case was closed and I knew which camera to go for. 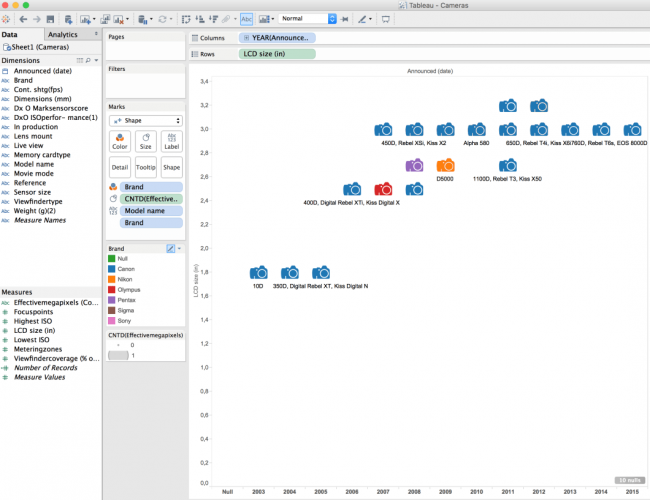 You can download a trial of Tableau software and try building something like this yourself next time you want to get an overview of a large amount of data quickly. Simply press this link. "//inviso.dk/tableau-trial"